Though small, Ebenezer Baptist Church has played a large role in America's history. 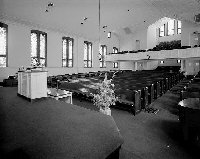 Founded in 1886, the church functioned as the epicentre of the Civil Rights Movement in the 1960s. Martin Luther King Jr acted as co-pastor from 1960 to 1968, and worked toward equal rights for African-Americans during this time. The church has a new premises across the street, but visitors can still tour the old sanctuary where King preached, before walking around the Martin Luther King, Jr. Park just outside. Annual events surrounding Martin Luther King, Jr. Day in January typically draw large crowds. Past speakers have included US Presidents, national and local politicians, and civil rights leaders. Remembrances are also held during Black History Month (February), and the anniversary of King's assassination on April 4, 1968. Opening times: Tours are conducted Monday to Friday 9am-4pm, Saturday 9am-2pm, and Sunday 2pm-4pm.